When a non-knitting colleague or friend sees me knitting with an open pattern in front of me, they’ll often take a quick glance and ask if I’m a) taking a multiple choice test or b) cracking a code. I always get a good laugh because, in some ways, they’re absolutely right! If I’m knitting up a multi-sized pattern, and I’ve circled or highlighted the stitch counts for my size, that’s pretty much multiple choice and if you’re never come across the language and abbreviations for knitting before, it might as well be a foreign language. The same goes for knitting charts - they are little boxes of code - but once you’ve cracked it (and have a few tricks up your sleeve) they’re a great tool! Today, I’m going to walk you through reading a lace chart for soup to nuts. And all you need to do is ask yourself three simple questions. A lace chart comes with two pieces: the Chart and the Key. 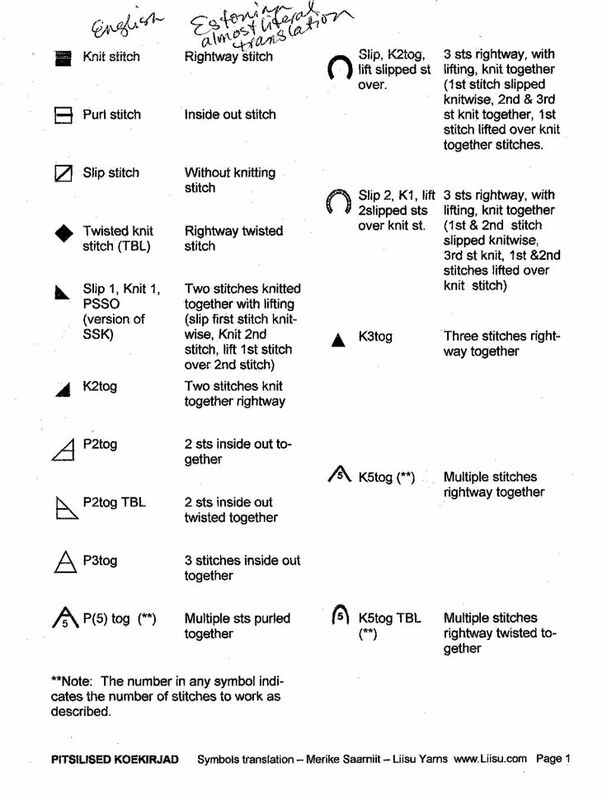 The Chart shows you the stitch pattern and the Key shows you what all those little symbols mean. Before you do anything, look at the Key. 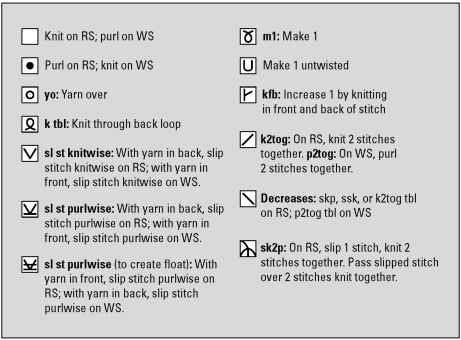 Some knitting symbols are fairly standard (a blank box is a knit stitch, a dot or a dash is a purl, a circle is a yarn over), but how different increases and decreases are displayed can vary by designer and publisher. can be any kind of left leaning decrease. Slip, slip, knit is a common one; but it could also be slip 1, knit 1, pass the slipped st over; or k2tog through the back loop. The designer will have made a choice in designing - so check the key and ask yourself our first question. Question #1: What do these symbols mean for this pattern? There’s a reason the designer chose that particular decrease - it could be that it plays to the design best, or it could simply be their personal knitting preference. If the design calls for a SSK but you prefer k2tog tbl - feel free to switch it up! It might result in a slightly different look, but it’s your knitting. (Is the Key missing? It totally happens sometimes in the process of getting something to print. Your best bet is to email the designer/publisher or you can see if there is a written out version of the chart and extrapolate from there). Now that you know what all the little symbols mean, you can start to read the chart. But before you get into the nitty-gritty (knitty-gritty?) of individual stitches, it’s best to look at some big-picture items first. 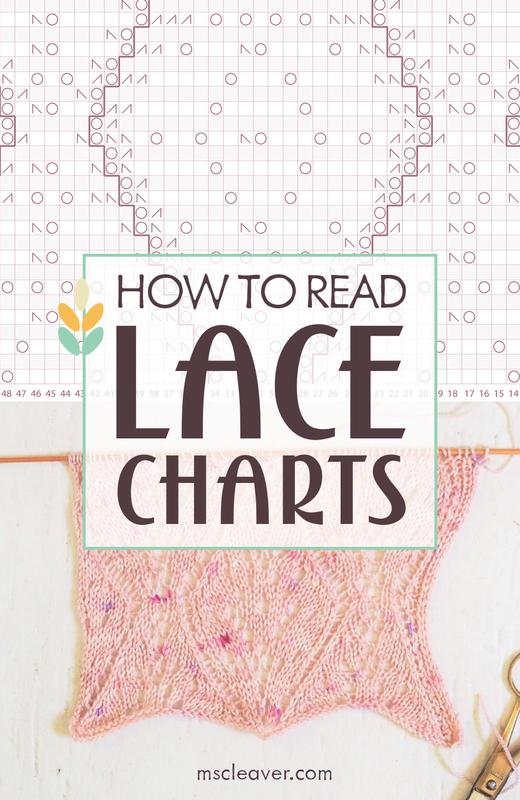 First, unlike text, you read a lace chart in the direction you knit. That is, right to left, bottom to top (see red arrows above). The stitches and rows should be numbered in this direction to guide you. A lot of lace patterns are designed so you don’t have deal with any yarn overs or increases/decreases on the wrong side of your knitting - you focus on all the “tricky stuff” on the front, then mindlessly purl your way across back. Even if a lace pattern in worked in the round, you often alternate between a lace round and a non-lace round. (Fun fact: patterns with yarn overs on every round are called openwork). But those “spacer rows/rounds” aren’t just nice from a mental break perspective, they make a big different in the way the lace looks - skip it and you’ll have a really squat-looking pattern. So they’re important to remember. Question #2: Is this chart showing every row/round or every other row/round? To tell, look at the numbers along the side the chart. If it’s a chart for knitting flat, right side row numbers (usually odd numbers) are generally listed to the right hand side of the chart. Wrong side row numbers (usually even numbers) are generally listed to the left hand side of the chart. The chart above is for openwork, there’s yarn overs on both right and wrong sides. All rows are shown, because you need to know what’s happening on every row. But a lot of times, there’s nothing interesting happening on a wrong side row. So to save space, the chart will omit it. On this chart, every wrong side row is purled, so the chart only shows the information on the right side. The numbers on the right read 1, 3, 5, etc, but instead of having a “spacer row” between them (as in the openwork above), they’re right next to each other. The same rules go for lace worked in the round. If all you’re doing on an even-numbered round is knitting, the chart probably won’t take up space to show you that. 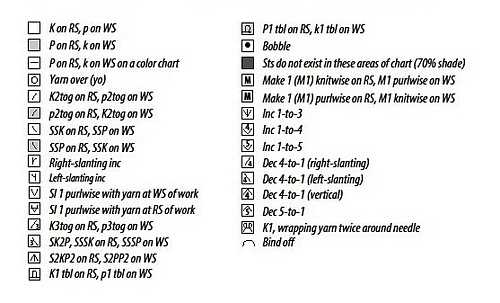 This chart is an example where every row/round is knitted, but there’s only lacework (i.e. yarn overs) done on the right side. So why bother with showing all the rows/rounds? Take a closer look at those wrong-side rows (in blue). The pattern combines purl bumps with the lace, so to carry that pattern, the bumps need to be worked on every row/round. Question #3: How does this pattern repeat? 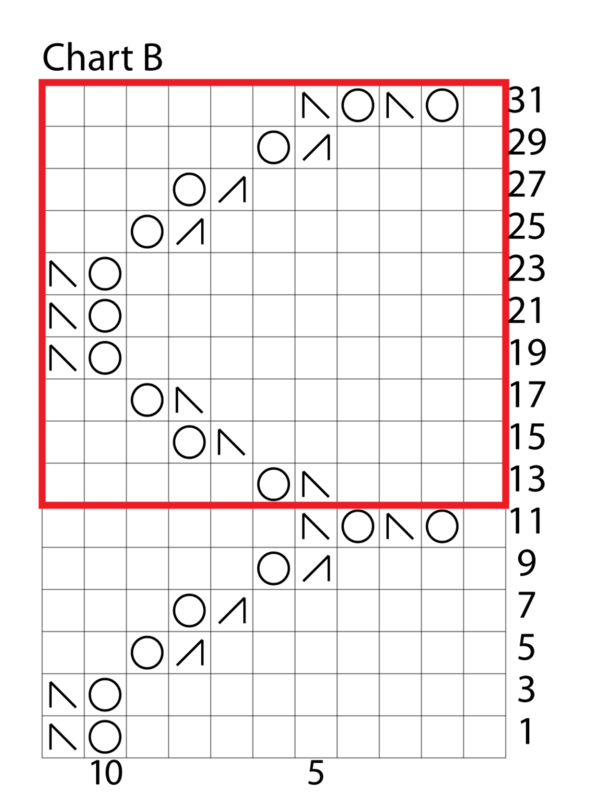 Since they’re generally both horizontal and vertical, repeats are typically shown with a box that outlines the repeat area. If we take another look at the chart above (which is designed for the top of the foot of a sock) - the full lace section (only 35 sts) is represented, but even with that there are repeats. Each repeat is 10 stitches wide and 9 rows high). But here’s where it can get tricky - you have a 10 stitch repeat over 35 stitches - there should be three full repeats, plus 5 extra stitches, right? If you look at the chart above, sts 24-33, they are almost exactly the same as sts 14-23 and 4-13. It acts like an additional repeat. But there's one important exception with stitch 33 on row 5. Instead of a double decrease, like the other repeats, it’s a single decrease. The other “half” of the double decrease is at stitch 3 on row 5. SO if you're marking out a repeat (on your page or in your mind) make sure it's a true repeat. Now, assuming that the item this chart is for something taller than 10 rows/rounds high. When you get to row/round 11, just start back at row/round 1. Here’s another chart (for a shawl), which shows only a portion of the lace section. Section A1 is worked across about 439 stitches, B1 across 411 stitches, and C1 across 387 stitches. But the charts for each section look about the same width. This is possible because each section uses a 6 stitch wide/12 row high repeat. The stitches on the left and right of the repeat box are just to get to to that repeating section. And that's basically how most lace charts work! With a large lace (or colorwork) chart - the trickiest part is keeping your place. There are a lot of tools available to help. You can purchase some pre-made items like magnetic boards or copy holders. If you are using something opaque (like a post-it), arrange it so the bottom of the marker is ABOVE the row you’re working on, so you can still see the rows you’ve already worked. That way you can continually check to see if everything is lining up appropriately. If you want some extra security when working lace, you can always put in a “lifeline.” To insert a lifeline, thread up a darning needle with some high-contrast colored yarn and slip it through the live stitches on your knitting needle, as if to put them on a holder. But instead of removing the stitches from your knitting needle, remove the darning needle and leave the “line” in and continue knitting normally. If you make a mistake you can’t easily fix, rip out back to the lifeline which will nicely hold your stitches for your while you put them back on the knitting needle. Only insert a lifeline into a row you’re confident is correct, and if you’re going to use them, I’d recommend inserting it after every repeat or more often if the rows are really long. With those answered, you should be ready to tackle some charted lace! The West Branch Cowl was designed to show off a special skein of handspun or hand-dyed yarn and is a great beginner lace project - the lace is only on the right side and has a short repeat. The Ferrous Shawl uses simple motifs that are easy to memorize and was designed for the complete beginner to lace shawl knitting in the traditional triangle shape. The Maian shawl consists of two 4-stitch repeats and all the increases are done on the edge with a backward loop cast on, meaning you won’t get your lace yarn overs confused with your increase yarnovers. The lace border on the Cresting Waves Shawl is only 21 stitches wide and is knit separately from the body of the shawl, so if you make a mistake, you only have to tear back a few stitches (instead of the whole body of the shawl) to fix it. Alaria uses the same construction as Ferrous, but adds some more complex motifs. Rambling Eden uses the same construction as Cresting Waves, but with a really wide border and openwork lace. Domenic Duck KAL - Afterthought Prep, Pick Up and Finishing!